In the state of Texas, large trucks were involved in 9.1% of all fatal crashes statewide. Due to their immense size Semi truck accidents are among the worst kind of motor vehicle accidents. Injuries from semi-trucks (also called 18-wheelers, tractor-trailers, and semi-tractor trailers) are often very serious because of the size and weight of the truck. Truck accidents can result in catastrophic injury, permanent disability or even death and anyone involved in a trucking accident is likely to sustain serious injuries. Truck accidents can be caused by negligence by the truck driver or another party. If you are injured and bring a claim against the trucking company, and show negligence, the injured person must show that the defendant breached a duty of due care to the victim, and that the breach was the foreseeable cause of the injury. If the truck driver (or trucking company) is found to be negligent, then the injured person may seek compensation for past and future medical expenses, lost wages, pain and suffering, physical impairment, paralysis, property damages and more. Where there is evidence of defendant’s outrageous conduct (such as alcohol or drug use), the injured person may also be entitled to punitive damages. However, the percentage of fault of each party will determine the damages you are entitled to, if any. In Texas, if the plaintiff (the party) is determined to be at least 51% at fault, then the plaintiff will not be entitled to any damages. Because semi-trucks are usually owned by large companies, Truck accident claims may be more complicated than car accident cases for a number of reasons. First of all, there are usually multiple parties involved such as the driver of the truck, the owner of the truck, the company leasing the tractor or trailer, etc. Trucking companies often have set up a series of corporations or entities to make it more difficult on parties bringing claims to identify everyone potentially responsible in a collision involving a commercial vehicle. Trucking accidents are among the most complex types of vehicular accident cases, often relying on a sophisticated team of insurance adjusters or lawyers who begin working on building a defense against you even if the accident was not your fault. If you have been injured in a trucking accident, you can protect your rights, claims and preserve valuable evidence. 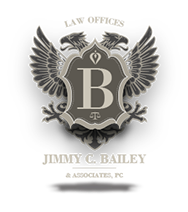 At Jimmy C. Bailey Law we can advise you before you talk to any representative from the truck company or their attorney and before you sign or agree to provided information to the trucking company’s representatives. If you have been injured in an accident involving a tractor-trailer, 18-wheeler, Simi or another large commercial truck, it is crucial to have an expert attorney who can represent your interests and investigate your accident claim AND when possible PRESERVE EVIDENCE FROM THE ACCIDENT. Jimmy C. Bailey Law has forty successful years of ability, expertise and resources to recover monetary compensation for each injured client as a result of damages, losses and injuries suffered – including medical bills for treatment of injuries, lost income, disability, disfigurement, loss of enjoyment of life from pain and suffering and loss of daily activities. We have a background of aggressive success and have handled trucking accidents resulting in settlements of over one million dollars.